Spot quiz: let's say you're taking the air on one of Northern California's many inviting trails, and you suddenly notice you have company. Large company. With fur. What do you do? Fortunately, most wild animals that live among us don't pose a serious threat to humans and some even make great neighbors, snacking on pesky garden pests and rodents. The key is in knowing how to adjust your behavior when you find yourself in the presence of a wild animal. Wildlife experts on KQED's Forum program discuss some important steps you can take to protect yourself and the animal from harm. Do Not Feed Wild Animals. Seriously, Don't. This is a huge no-no, says San Francisco-based writer Rachel Levin, who dishes out plenty of tips in her useful, engaging book, Look Big: And Other Tips for Surviving Animal Encounters of All Kinds. She says too many conflicts between wildlife and humans occur because the critter is being fed by some people and not others. "The animal doesn't understand why some humans feed him while others don't," said Levin on Thursday's Forum. Levin says that feeding wildlife creates an expectation in the animal that can lead to it becoming a nuisance. But the next human the animal approaches may not be so friendly and may take extreme measures to get rid of the critter. So experts say it's best to resist the urge to feed one, no matter how cute. This one should be self-evident, but in the words of Forum host Michael Krasny, "People do some incredibly stupid things." These motion-activated sprinklers are an effective means for scaring wildlife out of your yard. It works for a host of animals, from wild turkeys and deer, to raccoons, rabbits and coyotes. The sudden blast of water causes critters (and sometimes unsuspecting human guests) to panic and run. Just make sure to install it in an area of your yard that's not frequently used. While this piece of advice might be easier said than done, going into flight mode can actually put you in direct line of danger. In the case of black bears, waiving your arms around and yelling is your best bet, say the experts. Levin says that these bears are "big chickens" and are not looking for a fight (a well-documented exception is a mother bear with cubs nearby). In the case of sharks, blend in with the background, says Terry Gosliner, a senior curator at the California Academy of Sciences. If you see a shark, avoid erratic movements that might resemble wounded fish. Simply wait for the shark to pass. Avoid spearfishing in an area patrolled by sharks. According to Gosliner, it's the equivalent of "dangling a raw steak in front of a voracious predator." Here's a low-tech way to discourage curious critters: drop three pennies into an empty soda can. The sound of pennies banging against metal produces an unpleasant sound for the animal, says Levin. Tape the opening and simply shake the can around when confronted with wildlife such as a coyote or a black bear. Levin says that coyotes in particular are afraid of the unfamiliar. 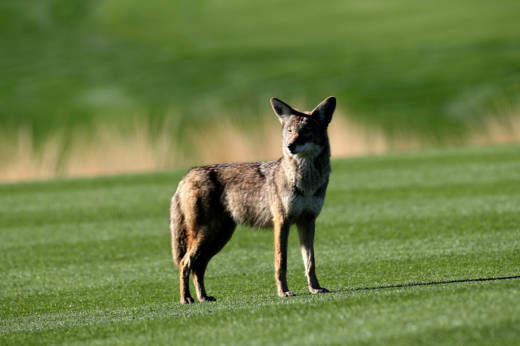 Introducing new elements into the scene, like an unusual jacket or an odd collar on a pet dog, can cause a nervous coyote to head the other way. Although humans can only contract rabies if there has been an exchange of saliva or blood, people don't always know when they've been bitten, according to Alison Hermance, a communications director at nonprofit Wildcare. If you encounter a sick or injured animal in the Bay Area, call WildCare at 415-456-7283 or contact your local wildlife hospital. They will help you determine whether and how to intervene. Lastly, experts say that it's important to keep in mind that the odds of a wild animal in the Bay Area harming you are incredibly slim. Should you run into an especially stubborn critter standing in your path, best to simply back away. If these tips seem like pointing out the obvious, Gosliner notes that "common sense just isn't common enough."